This Art Matryoshka features the face of a lovely girl with dark blue cape and realistic scenes of famous sites of St. Petersburg, Russia. 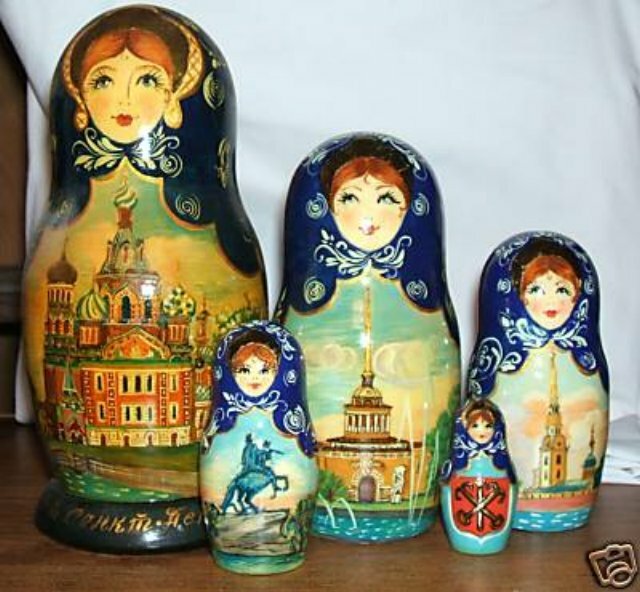 The outer doll features the cupolas of Church of Our Savior, and the dolls feature the tall spires of The Admiralty, Peter and Paul Fortress, and statue of Peter the Great riding into St. Petersburg, and finally a shield with the City Crest of St. Petersburg. The largest doll measures at 7 inches and the smallest at 2 inches. Signed and dated on the bottom 2002.